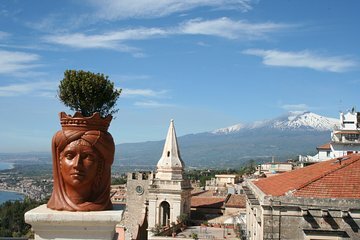 Esplora il Monte Etna, il vulcano attivo più alto d'Europa, nonché la deliziosa città di Taormina in questa gita di un giorno da Cefalù in Sicilia. Bevi le fantastiche viste durante il viaggio verso l'imponente vulcano e considera la possibilità di scegliere la funivia e la jeep in cima alla cima dei crateri fumanti. Prendi il resto del pomeriggio per scoprire Taormina, fermandoti nel secolare teatro greco, fermandoti in Piazza IX Aprile nel centro della città o rilassandoti sulle sue meravigliose spiagge. Fatti venire a prendere al tuo hotel a Cefalù o scegliere da una posizione vicina e selezionata nel centro della città e poi salire su un comodo pullman con aria condizionata per iniziare questa gita di un giorno pieno d'azione sull'Etna e sulla città turistica di Taormina. Durante la corsa, goditi lo scenario del paesaggio siciliano. E poi inizia la salita sul Monte Etna, il vulcano più alto d'Europa a quasi 11.000 piedi (3329 metri). A 6.562 piedi (2.000 metri) scendi dall'autobus con la tua guida e prenditi un po 'di tempo per passeggiare per la zona, bevendo i fantastici panorami e fai una visita ai Silvestri Craters, due minuscoli crateri. E se sei curioso di salire in cima al vulcano, prendi la funivia opzionale fino a raggiungere i 2.702 piedi (2.500 metri). Abbandonati qui e ammira gli incredibili panorami della Sicilia, notando il netto contrasto tra il rigoglioso paesaggio e il rigoglioso paesaggio in cui ti trovi. Vuoi una visione ancora migliore? Scegli la corsa in jeep opzionale fino alla cima del cratere. Segui la tua guida fino alla cima e scopri la storia del vulcano. Al termine della camminata, torna alla stazione base per riunirti al resto del gruppo. Prendete un po 'di tempo libero per il pranzo (a proprie spese) e poi dirigetevi verso Taormina, una splendida città sulla costa che è stata una popolare destinazione turistica per 200 anni. Goditi il tempo libero per esplorare la città in modo indipendente, passeggiando lungo Corso Umberto, la strada principale fiancheggiata da negozi di alta moda, o soffermati per un po 'in Piazza IX Aprile. E un sito da non perdere è l'antico teatro greco, una delle rovine antiche meglio conservate in Sicilia. Scopri la storia di questa incredibile rovina, costruita dai Greci nel VII secolo aC. Dopo un po 'di tempo, incontra la tua guida all'ora stabilita e torna sulla strada costiera per Cefalù, saltando giù dall'autobus per scattare una foto dello Stretto di Messina, prima di terminare il tour al punto di partenza. Our tour guide Carmen was excellent- helpful, friendly and very good at telling the multi lingual tour attendees interesting information about what we were seeing in French, English and Italian. Ou driver Massimo was also excellent. We both enjoyed the Etna part of the trip a great deal and the weather was brilliant so we had very clear views throughout the time that we were there. It was very interesting and really impressive to see. We would have liked to stay longer ideally. We then went an hour's drive on to Taomia and had 2 hours there- but would have liked to remain longer as 2 hours did not feel long enough to see everything. On the way back we were driven through Messina which was interesting as you can see the Italian mainland very clearly fro there. I found the amount of time spent sitting on the coach while we drove to Etna and on the way back was too much as I all you spend a good 7 hours sitting on the coach driving from Cefalu to Mount Etna and back to Cefalu at the end of the trip, which I feel is too long. However, I did really enjoy seeing Mount Etna I just would have liked more time there and more time in Taormina too. In fact, we DO NOT RECOMMEND booking excursions through VIATOR. We came to Sicily specially for our eight-year-old son to see an active volcano and our trip was not held because the timetable mentioned in the voucher was wrong, the bus departing an hour earlier. Local representatives of Viator did not verify or inform us of this fact. Enjoyed tour, tour guide Mariio was knowledgable and friendly. This tour was excellent for its content! The first half of the day was Mt. Etna and the 2nd half Taormina, including the Greek Theater. Loved it. We were a family group of 7 - English. We were the only English on the tour, the others were French or Italian. Our tour director tried to cover everything in all 3 languages, but that was difficult to do. Our only complaint would be that we felt we missed a lot of content as his main delivery was in the other 2 languages. Not quite what was advertised. Other than that, it was great and we would highly recommend. 1. My first experience of a multilingual guide - nice guy, who spoke Italian and French beautifully but English erratically, and liked to show off his linguistic skills to the Italian and French passengers which he did, at the expense of the bemused Brits on board. 2. Guide never had any intention of letting the few of us on the tour who wanted to view Etna's main crater, queue for up to an hour for transport to the top of the volcano. He must have known before we arrived how long the wait would be - he told us he had been taking groups to Etna for at least 15 years. Queues to visit the top must be a regular occurence but hanging around at Etna would have screwed up the schedule. Fair enough, but why, in that case, advertise the trips to the top at all? 3. No stop for a photo opportunity at Messina although, again, it was mentioned in the blurb advertising the trip. 4. Left Taormina at 4.00pm and arrived back at Cefalu at around 7.15pm without any comfort break of any kind. In fact a woman was so desperate she had to ask to be let off the coach in Cefalu and run into a cafe for the toilet. 5. Finally, although we reached Cefalu first on the coast road we went straight past and on to other hotels well to the west of the town. Then, when we finally got back to Cefalu, we had to sit waiting for a shuttle bus because the guide claimed the coach driver would have trouble negotiating the twisting roads and traffic in Cefalua. Nonsense, he was in fact a very good driver and had managed far tighter and tougher challenges earlier in the tour. It was simply too much trouble for them driving into Cefalu. Not good enough, Viator. You'll have to try harder I'm afraid. Mt. Etna was busy so we couldn't make the ski lift to the top but out guide made the experience great. Lots of interesting facts along the way. The bus was very clean and comfortable. Long journey but Mount Etna was worth it despite the long queues and the fact our Etna guide only spoke Italian and French despite a request for English and us having booked this tour in English. I liked the tour very much and was lucky to be picked up at my hotel even though the hotel was not included in the hotels from where you would be expected to picked up from. The weather was perfect for visiting Etna. I went all the way to the top, where there, of course, was a bit windy. After Etna we were allowed some two hours in Taormina, but then again you got to wait for the shuttle bus from the carpark and you do not know the city. Even though it is not very big I gave up to see the antique theater being afrait of not being able to be back on time. Our guide had a hard time translating into English, Dutch and French. She did that constantly while we were on the bus, except for the last hour. In my opinion it would have been nice if she only had translated into English and French and then not constantly. Actually, I was considering it to be a good idea for the participants to have their on audio guide from where to choose their preferred language and also the degree of information to receive. If you ask me today I really do not recall very much of what she said. She did an enormous job, though.